People in the Mariner, Mill Creek and north Bothell areas will be freer to move about growing Snohomish County without a car when the new Green Line bus-rapid transit route opens Sunday. Buses will arrive every 10 minutes weekdays between 6 a.m. and 7 p.m., and every 20 minutes nights and weekends. Equally important, they will connect to the Blue Line that runs along Highway 99. Trips should be one-third quicker than local buses on the same roads, said Martin Munguia, spokesman for Community Transit. The line goes 12.3 miles from Paine Field to Canyon Park next to I-405. The $74 million project, of which $48 million was federally funded, provides new stations with sidewalk ORCA fare-card readers. Ticket-vending machines are also available, an amenity King County Metro’s RapidRide doesn’t offer. 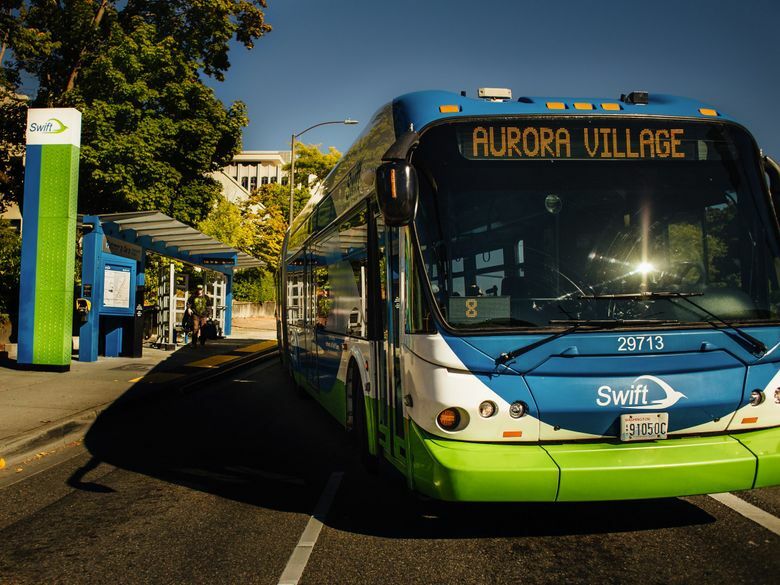 There is no cash farebox on Swift buses, which are supposed to stop at stations for only 10 seconds. For added speed, transit priority signals allow an approaching bus to keep the traffic light green four seconds longer, or trip a red light to green sooner. Short bypass lanes for buses to avoid traffic lineups were built where 128th Street Southwest eastbound approaches I-5, and at two other intersections. Bus-only lanes cover the northern 3.6 miles of the route. In fact, an Edmonds Community College student or worker who lives in Mill Creek may find it easier to catch the northbound Green Line bus, travel north to Highway 99, then backtrack south on the Blue Line toward Edmonds, than to slog directly along 164th east-west in gridlock. Swift Green Line is expected to attract more than 3,700 daily passengers, increasing to 4,700 by 2035, according to the project’s Federal Transit Administration profile. About 600 riders are expected to transfer back and forth to the Blue Line on Highway 99. The FTA says the corridor “has ample opportunity for revitalization and sustained growth,” because just over half the land is vacant or underused. Snohomish County as a whole has grown 13 percent in population this decade, to 805,120 last year. Community Transit hopes the Paine Field airline passenger terminal, which opened March 4, will attract more bus riders. In addition, Boeing’s private shuttles are being rerouted to meet Green Line commuters at the Seaway Transit Center, next to the aerospace company’s Everett manufacturing works. “It looks like about 12,000 out of the approximately 27,000 people in the primary shift at Boeing live within reasonable walking distance of either a Swift Blue Line station or a Swift Green Line station,” meaning one-half mile, said Rollin Behee, the transit agency’s strategic planning director. The Green Line passes dense suburban clusters — apartment colonies that are easily overlooked, but provide affordable housing for workers priced out of Seattle and tony waterfront communities. The Mariner neighborhood just west of I-5 is home to more than 7,200 people, half ethnic minorities, next to the Green Line. Access to transit is often hindered by strip malls, parking lots, fences and long driveways that discourage walking. Local cities aren’t adding new walkways yet, something Munguia figures will take a couple years. He points to the Blue Line, where Edmonds and Lynnwood overhauled land-use rules since the route opened in 2009. Some newer housing faces the Swift stations on Highway 99. In the city of Mill Creek, which has a three-decade tradition of residential trails crossing parks and wetlands, officials are eager for the Green Line but didn’t discuss bus-station shortcuts in a recent capital-plan update. “A connected community is important to us,” said Joni Kirk, communications director. The project is still early, so the city can observe how people use Swift to guide future improvements, she said. A grand-opening ceremony will be held at McCollum Park at 11 a.m. Sunday, to include speeches, a caricature cartoonist, musicians, food trucks and commemorative Green Line ORCA fare cards. The first bus departs at noon. 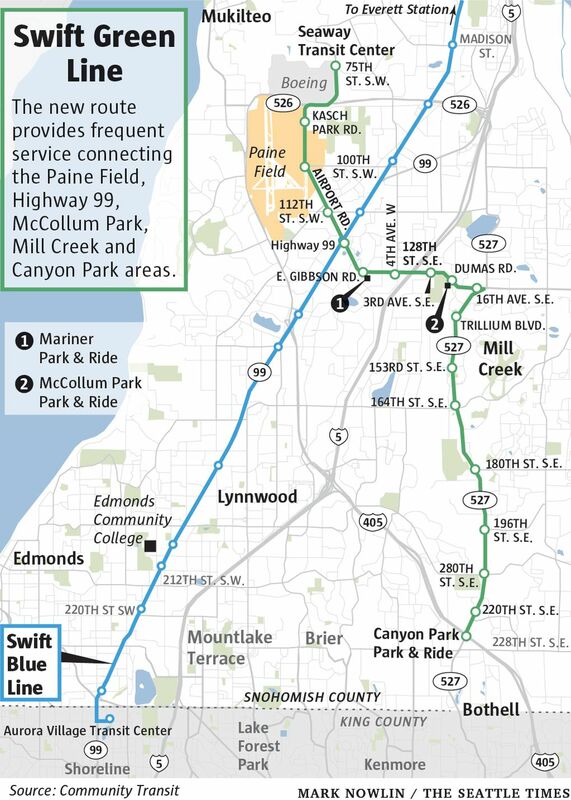 The next Swift route is the Orange Line, a mostly east-west path from Lynnwood to Mill Creek, funded partly by a sales-tax increase voters narrowly approved in 2015. Service is aimed to start in 2024, so buses can deliver commuters by the time Sound Transit’s light rail reaches Lynnwood Station that year.